Other stories in this collection focus on the controversy surrounding illegal immigration and the US-Mexican Border. “Ex Voto” finds a young Mexican relinquishing his dreams to discover his art, while in “Undocumented” a rancher tries to save his land, at risk of his soul. 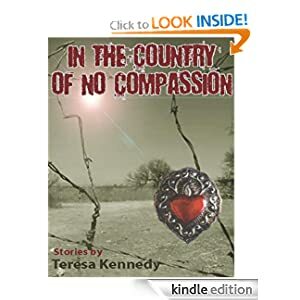 A resident of Tucson, Arizona, author Kennedy’s take on the issues is up close and personal. Hers is a vision rich with humanity, the promise of redemption, and a timeless understanding. As she leads readers through the borderlands of myth and reality, she reminds us that for all of our wars and conflicts and failings, God never takes sides and that compassion is indeed revolution. The video is very powerful, and the music is awesome. Honestly, after watching this, I expected the writing to have a lot more kick, you know? I’ve been thinking this over since yesterday; I’m quite torn on what I’d rate the overall collection of stories. If I were to rate them one by one, I would absolutely say, without a hint of a doubt, that “The Thirteenth Step” is a 5 out of 5, it’s the rest of them I’m not so sure about. The writing is good, there’s no doubt about that. The author’s voice feels a bit different to me, especially different in the case of “The Thirteenth Step”, while the others feel like more of a kind, more homogeneous in a way. The solid constant is the social messages; each and every one of the stories carries a powerful message, and it’s a great muse for writing, provided you manage to create the emotional response. In my case, there was plenty of emotional response for “The Thirteenth Step”, but not so much so in the case of the other stories. The points made are all interesting, and they all do give you something to think about. In the case of such writing, just getting you to ponder on the issues is a success. I can’t help but think my lesser emotional involvement with the other stories, aside the first, has a lot to do with cultural differences. No matter how emphatic the point is made, and no matter how well read or documented the issue is, you won’t have the same emotional response as someone that has been directly confronted with the issue. Addiction is something every culture is very much so in direct contact with, and it is the sort of issue that affects greatly when it arises in your close proximity, so it may be why it has elicited the most emotional response from me. Did I enjoy reading the whole collection of stories, on the whole? Yes, I did. But I wasn’t as enthusiastic about them on the whole as I was of the first one. I do recommend this read to people that enjoy reading stories based on real and throbbing social issues; they’re well written, well thought out, well put together, and I’m sure more of effect for some then others. You’ll just have to read them for yourself to find out which of the cases you are.